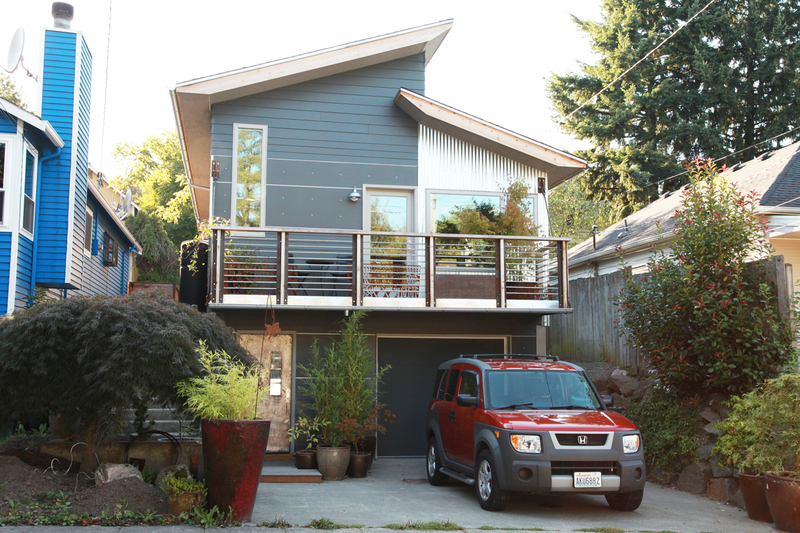 The “Blue View, Green Built” home is a net-zero energy remodel (or nearly net-zero) in the Green Lake neighborhood of Seattle that was featured on the 2013 Seattle Green Home Tour. The original home was well located, with excellent structure and solar orientation, and the owner purchased it with the intention of transforming it into a “deep green” home on a modest budget. 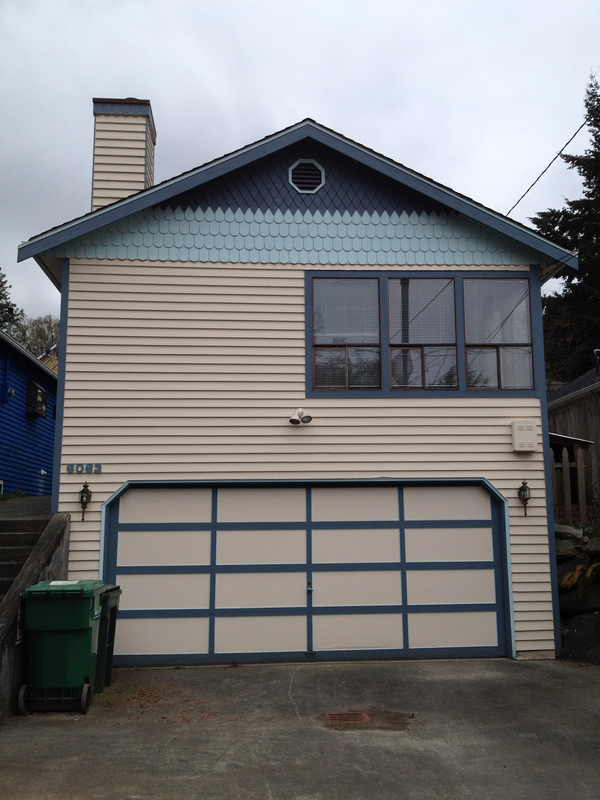 She has written a great blog about the process (and came up with the name of the home). Changes to the home included creating an open floor plan at the upper level and converting part of the basement garage space into living space, so the home maintained the same footprint, but increased living space from 1000 SF to 1640 SF. In addition to the aesthetic transformation, the remodel focused on creating a beautiful, healthy, and efficient home that is an example of affordable green building strategies. Interior photos demonstrate the bright, open spaces at the upper floor. 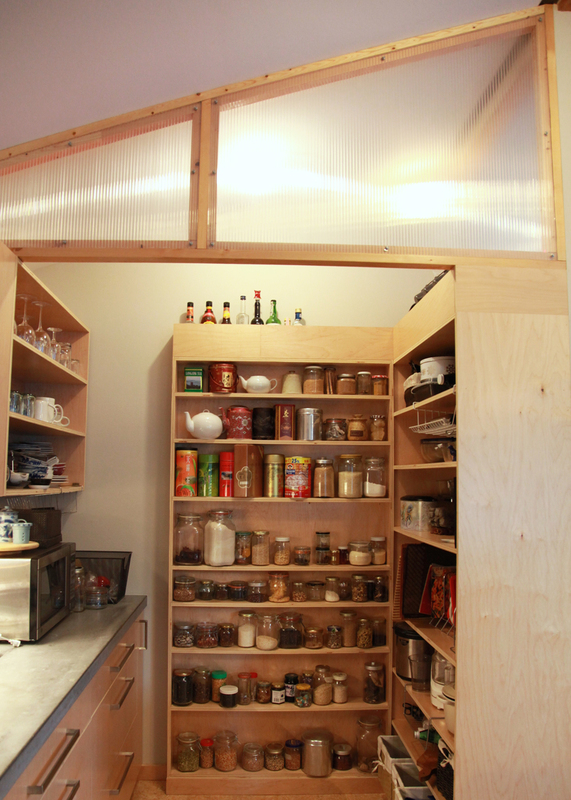 The upstairs bathroom and pantry area is enclosed, but has translucent panels that allow natural light to enter those spaces. LED light strips at the translucent panels allow for a beautiful glow at night time (with the option to change colors for special effect). 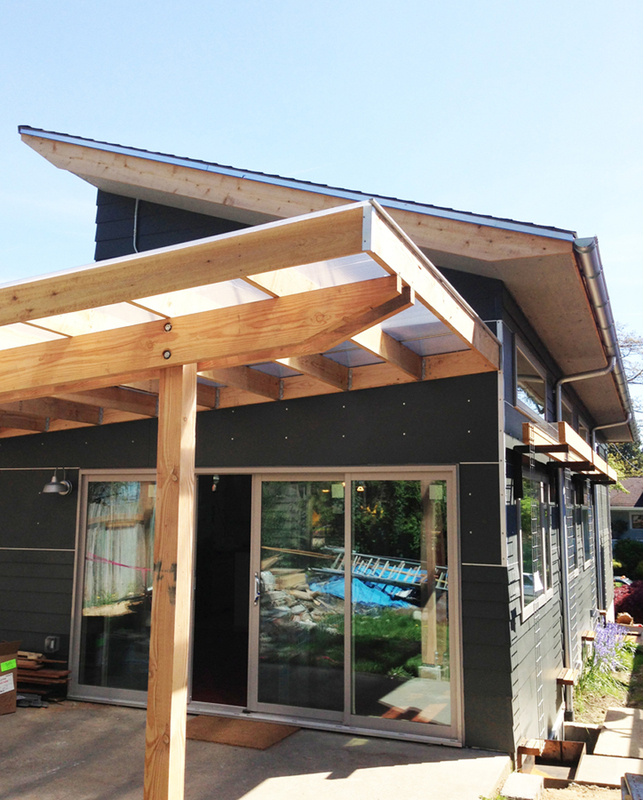 The wood trim used in the project was salvaged from the deconstructed wood structure in the existing home. 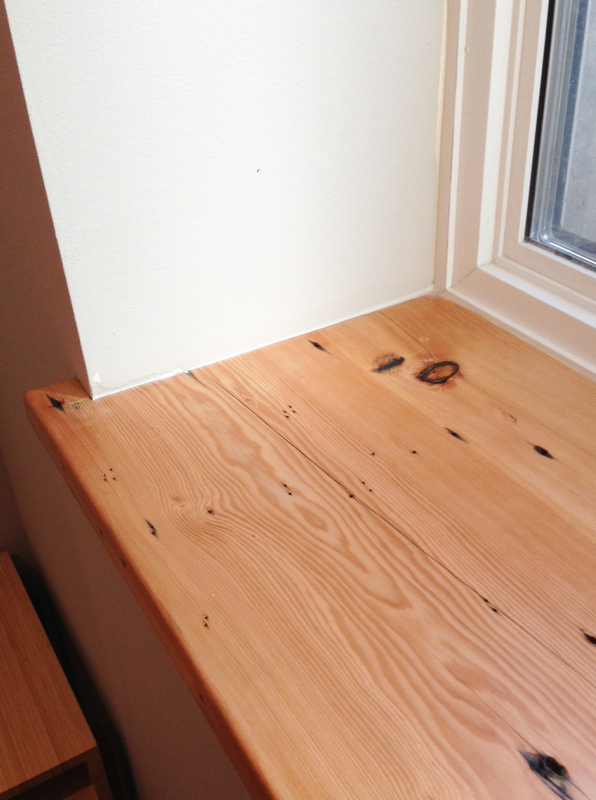 The stair railing posts were milled down from the headers (larger wood pieces over door openings) and the window trim was made from the floor joists that were removed to create a new stair opening. You can see the marks of the nails that were removed. 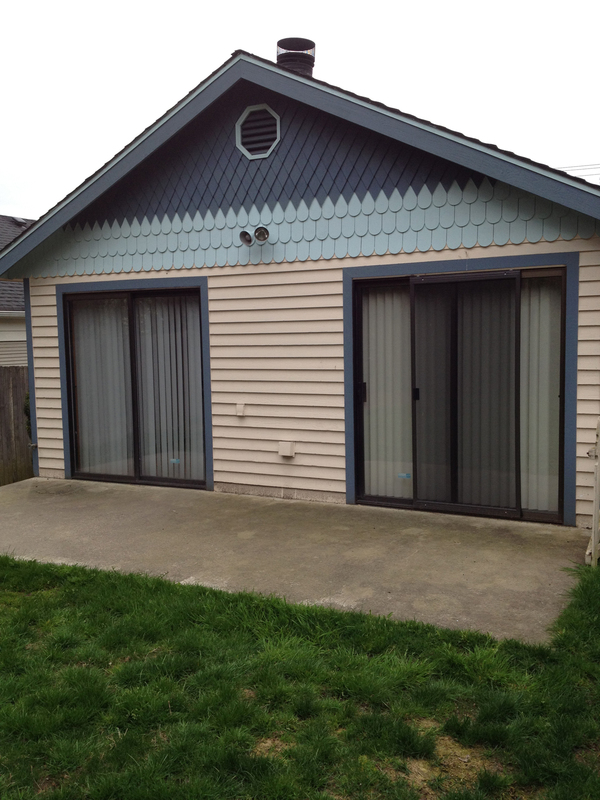 In order to keep costs down, we explored ways to use materials creatively — the shower is “tiled” with stained, sealed hardipanel (a product typically used for siding houses) and the patio roof is designed with inexpensive structure and twin wall polycarbonate (usually used for green houses). And, it must be mentioned that the owner is a talented gardener, so the home is designed to be a good backdrop to the lush gardens planned for the future. The siding color was selected to highlight the vivid natural colors, and the “garden balcony” has planters integrated into the railing design. 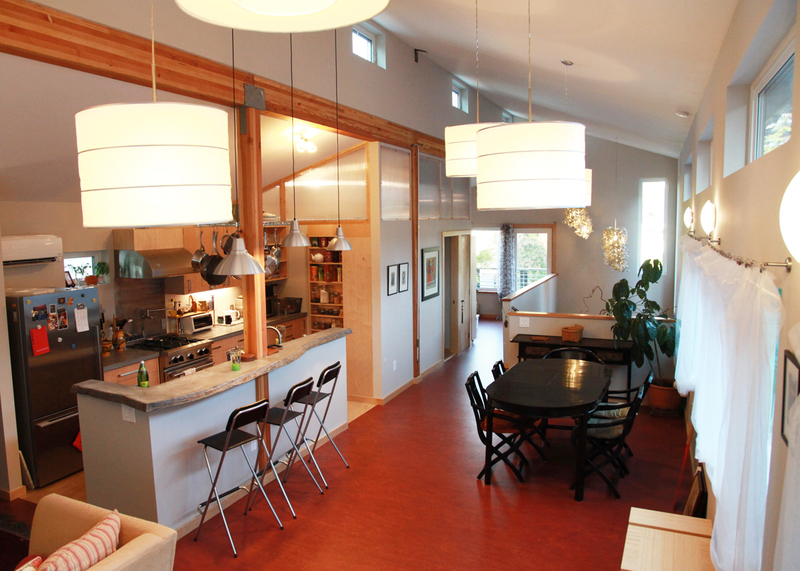 You can read more about the specifics of the green building materials and systems used at the project spotlight page for the Seattle Green Home Tour. There are also a couple of blog posts that show the SIPS panels being installed, as well as documenting the busy day of the green home tour. There have also been some articles about the project in the Daily Journal of Commerce Green Building Blog and at the Good Life Northwest Blog. It has been a fantastic success story — an owner inspired by seeing green homes on the tour ends up realizing her dream two years later by being on the tour herself. Roll over for more information and click to see a slideshow view. Photos by Holli with an i Photography unless noted otherwise. 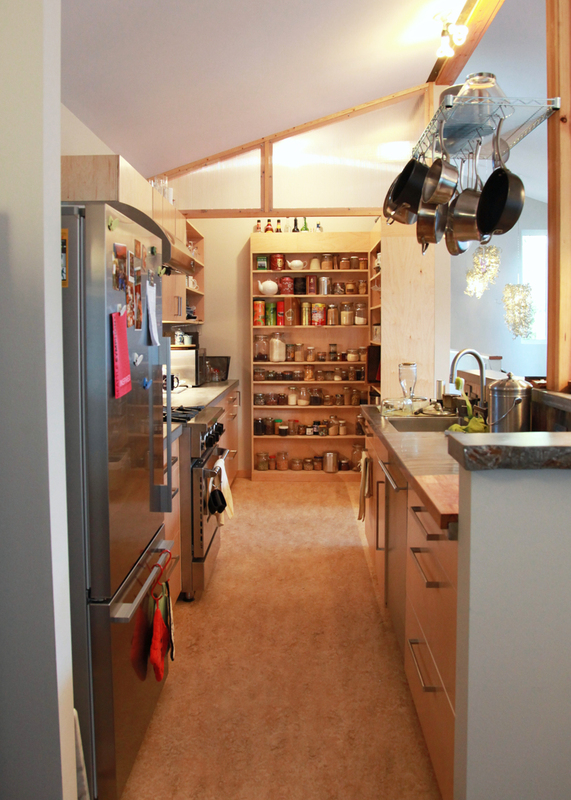 The kitchen is beautiful and highly functional. Concrete countertop formed with bark from an onsite cedar tree. Photo by Parie Hines. View from the office/ guest bedroom out to garden balcony. Structural insulated panels (SIPS) are stacked up, waiting to be fit together. Photo by Becky Chan. 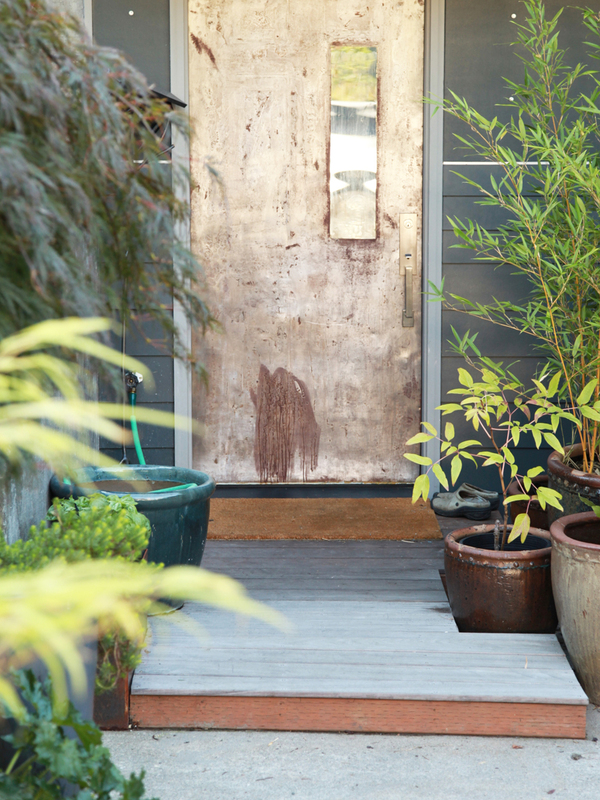 Front garden balcony adds outdoor space and opportunity for gardening. The north side of the house has much of the technical infrastructure for the home. Photo by Becky Chan. LED lightbulbs can be controlled from a smart phone, and can be set to a variety of colors and intensities. Photo by Parie Hines. 6.72 kW solar array. Photo by Becky Chan. A view towards the dining and living room. 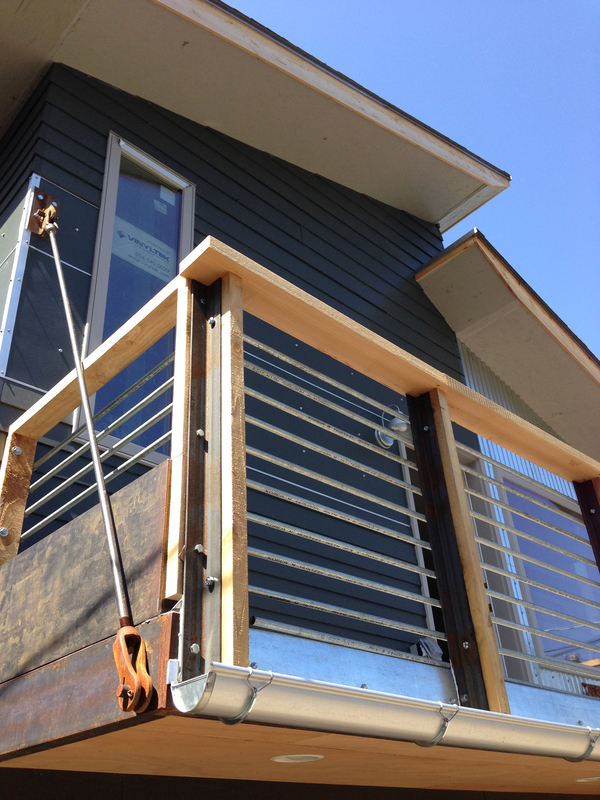 Front garden balcony is suspended from the home with steel rods. Translucent panels above the bathroom and pantry have glowing LED light strips, which allow for changing colors. The garden begins to grow in around the new home. Stair railing posts milled from door headers salvaged onsite. Large cisterns capture rainwater for use in the garden. Photo by Becky Chan. 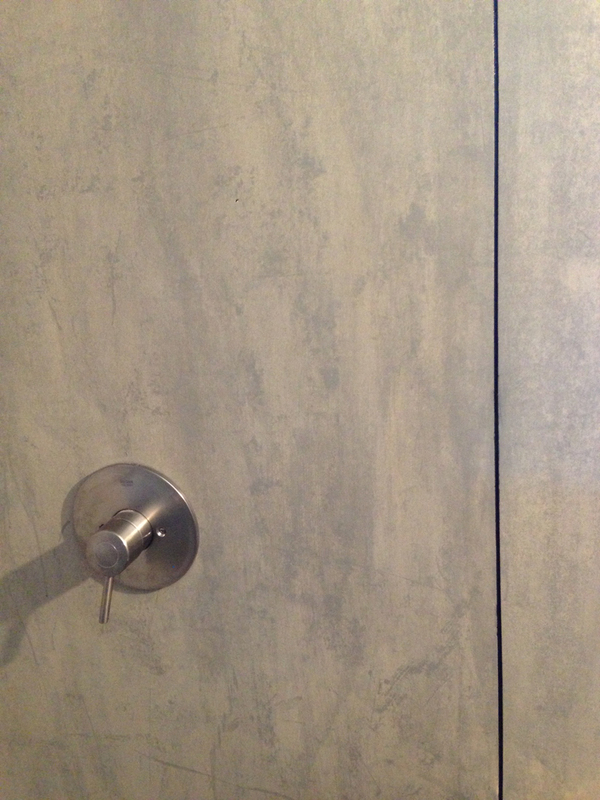 Stained and sealed hardipanel (fiber cement siding product) used for tiling the shower. Photo by Parie Hines. Cabinets are made locally from FSC certified prefinished maple veneer plywood with no added urea formaldehyde. 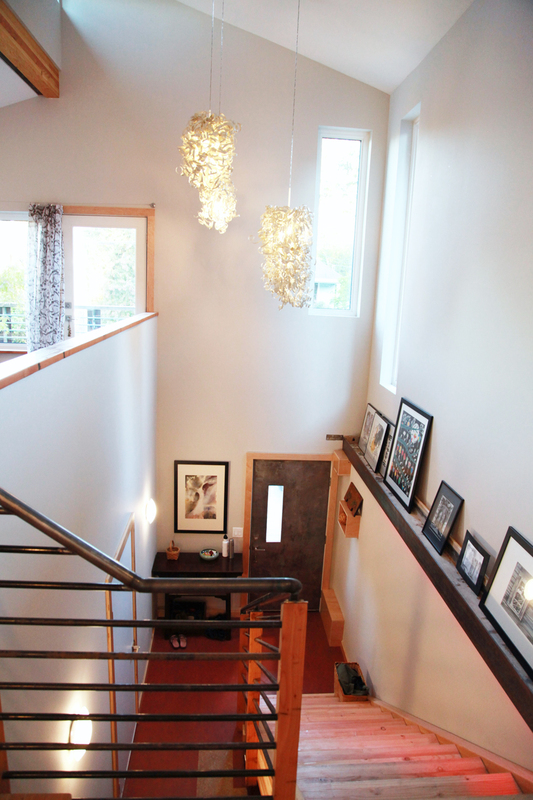 A steel beam required for retrofitting the structure becomes an art shelf and lighting element at the entry. Bathrooms are simple and elegant, with concrete countertop made on site. Structural insulated panels (SIPS) during installation. Photo by Becky Chan. Dramatic lighting at the entry stair. 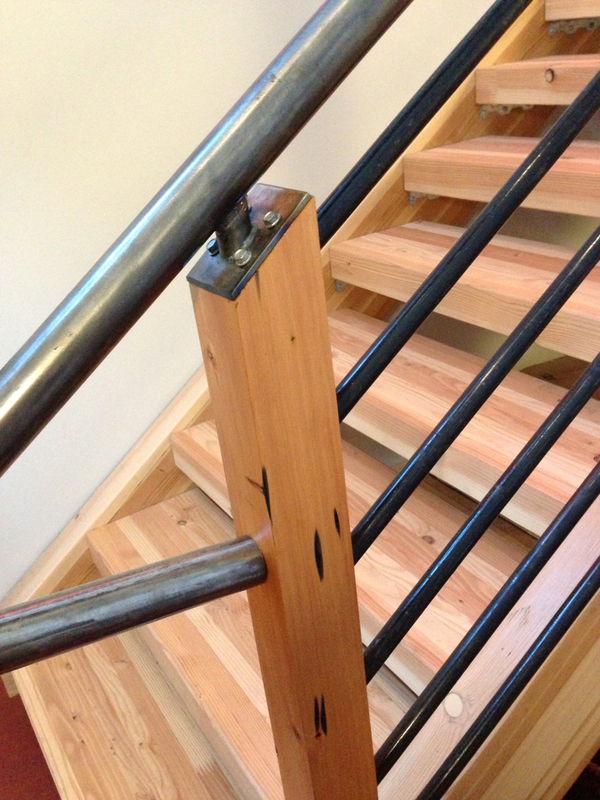 Engineer lumber (glulam beams) used for a cost effective open stair design. 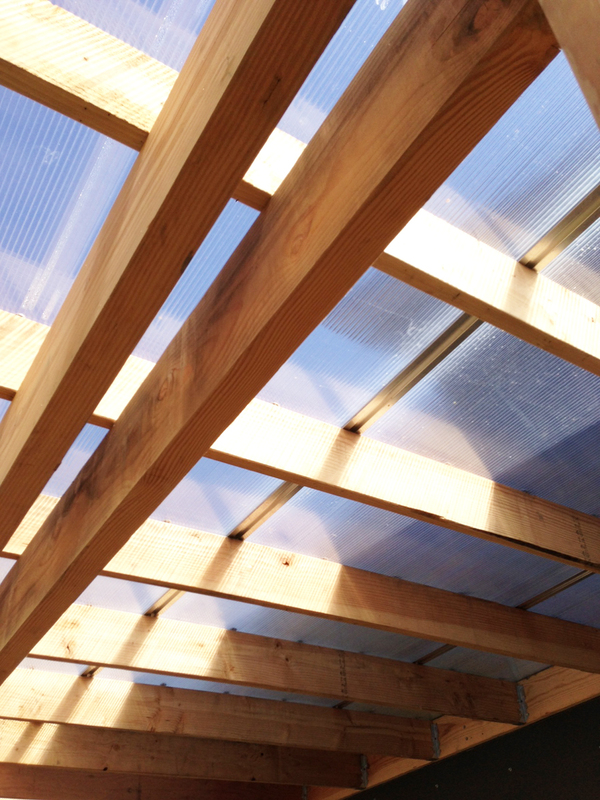 Upper windows provide great lighting quality and natural ventilation opportunities. The roof panels are craned into place. Photo by Becky Chan. A view of the dining area. A view to the kitchen.